I have been a Ham for coming up on 50 years and have had the chance to meet (some actually in person) the greatest people in the world, literally, from here in CA. to a dear friend WA2TWS in N.J. to Europe and Asia. What a wonderful hobby that contains all of the "good" things a person could strive for in life; self education, meeting great people, self fulfillment, and a good work ethic. When I was 12 years old in Jr. High school, I was lucky enough to have a science teacher who was a Ham and he was kind enough to "Elmer" me and several of my friends. We learned the Code and theory and all became Novices. That was in 1960 / 61 and I became WV6SBB in June of 1961. As with most of us, I couldn't wait for that magic letter from the FCC and I still have my Novice framed on the wall. Of all of the things I have done in my life that is my proudest possession. My dad was a wonderful supporter of my hobby and allowed me to string wires all over the roof of hour home. He passed away in November of 1961 and I have the wonderful satisfaction of him knowing I made it, at least to Novice. In 1962, after reaching the 8 wpm limit, I caved in and got my Tech. There I stayed, working 2 meter AM and SSB, building various pieces of equipment, which was almost as self fulfilling as working on the air. 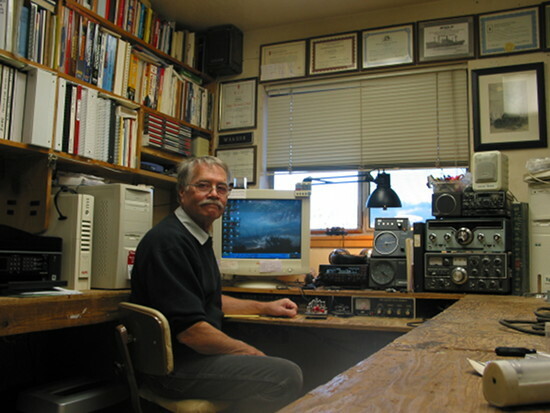 Things slowed down on Ham radio when I married my High School sweetheart in 1973 and found that working full time in electronics took most of my energy. Then in 1978 I took and passed the First Phone and decided to re-learn CW, this time the correct way, by sound! I also persuaded my wife and son to get into Ham radio and we all took our tests, I the Advanced, 13 WPM Code, Extra, and 20 WPM Code, my wife her Tech, and my son, his Tech. So, form my start with Home Brew 2 meter AM to 2 meter SSB with a Gonset Sidewinder to Home Brew HF (including a SK28A, which I still have) to a TS-520, then TS-930 which is down for repair and will be up and going when I find time, and now FT-450, running CW 99% of the time, I have had the time of my life and wouldn't trade it for anything! When I retire I will sit in the passenger seat and run CW mobile while my wife drives. That is what I do look forward to in the future, hopefully working my grandkids, hihi. I am a member of FISTS # 2394, QCWA # 28082, OTC and OOTC # 4440 as well as MEGS, MTC, Wireless Pioneers, and various other wonderful Ham associations. And now, NAQCC # 4316, Thank you!